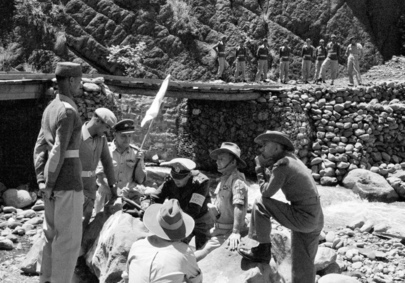 This picture, taken on the cease-fire line, shows a meeting between Indian and Pakistani officers and members of the U.N. Military Observer Group. The meeting was held to investigate an incident and interrogate a witness. Two Pakistani officers (l to r) Major J.D. Murray (Australia), Major Emilio Altieri (Uruguay), Lt. - Col. R.H. Marson (Australia), and an Indian officer. Back to camera is Major F.H. Moy (Australia). 1955.